Any chance you can buy the ammo w/o the mags? I do not need anymore mags but would love to increase my ammo stash while saving a few bucks. BEST ANSWER: The ammo is priced so good the mags are free. Never too many mags, but you can always sell them to friends at a price no one can match and your ammo will be even a greater deal. Yes, you can. ..! Palmetto sells the same Ammo. As is advertised here in this Ad....!! IN answer to Michael's question, 'can he buy the ammo w/o the mags... I encourage him to go to the Palmetto website that is listing the "special" and look up "ammo" for sale. Palmetto's prices are comparable to any other seller on the web, sometimes offer better pricing. The "specials" offered are usually really good deals... if one has the need. I only ever see this deal with the mags. My suggestion is that there are always people who want mags. Buy em, then sell them on E-Bay or something. I’m sure you could buy the ammo w/o the mags. Don’t know how much though. You’d have to ask Palmetto. You never have enough of both. Jus sayin. I dont think they do that with this package deal, but the ammo deal is ususlly available you'll just have to be patient. This was such a great deal that I couldn't pass it up mags and all. Usually they have deals for the ammo by itself. 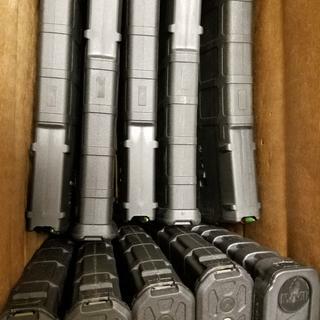 Can I pay more and get Gen 3 mags instead? What is The difference between this and green tipped? BEST ANSWER: There is no difference. 62gr steel core is the same thing as green tip. One in the same. The green paint. Its still a steel core LAP round. 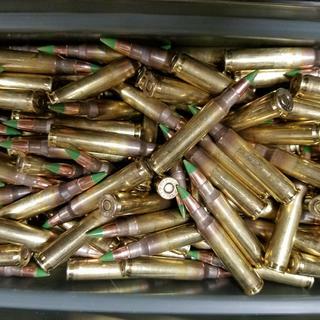 This is the 62 grain green tip ammo. The non green tip are the 55 grain. There is no difference, it's the dame ammo. It’s the same as far as I can tell. Yes. A hint is steel core! Yes the projectiles are magnetic because of the steel insert. The cases are brass. Yes. Steel core ammo is magnetic. Are the 1000 rounds of 5.56 ammo reloadable? Steel cases are not. Brass cases are reloadable. Yes Tom, 100% reloadable. I will be reordering this product soon...I am very happy with the ammo and magazines. Yes, this is reloadable Boxer primed brass cased ammo. The cases are brass. It is new ammunition. Why doesn't this ship for free? What does steel core mean? BEST ANSWER: Inside of the soft lead jacket, the is a small steel rod. This allows for barrier penitration, concrete, steel and so forth. Great to have on hand, but not a plinking round. This means under the soft metal jacket, is a hard steel rod for penitration of barriers, concrete block, metal and so forth. The core material is.mild steel, not lead. I'm afraid I do no know the answer. I just wanna know if the tips are painted green or not !? BEST ANSWER: The tips are painted green. These are the ss109 projectile. The ones I received had green tips. Yes, the ones I received were. Yes, they are green tipped. No it is new not reloaded. All of my ammo was new. By law.... are these rounds considered armor piercing? BEST ANSWER: I don’t know about the law but there are some gun ranges that won’t allow you to shoot that particular round at their facility. I would contact your local ATF Office for that info. Then please educate me on what the significance of a steel core is then?? Because from what I saw steel core equals AP. EnterM855 was removed from the ATF’s list of AP rounds. I haven’t been able to track down when this change took place, but I thought it was important to share to all those that have considered M855 to be AP rounds like I did. a reply to Greg H.
Ok. Just curious because my order is taking some time to process and I figured I’d do a little digging and saw that the particular state I reside in at the moment does not allow AP rounds. So I got curious. Don’t know for sure but they aren’t armor piercing rounds. No these rounds are not consider armor piercing. Ive only glanced online but from what I “glanced” at it seems as if steel core is considered AP rounds..? Depends on the state you live in. Will these rounds work well with my .308? An article I read said that some will and some won't. BEST ANSWER: As A.Bunker would say........ Whhaaaaaattt!! The magazines and ammunition are designed for the ar15 in 5.56 or similar cartridge and are NOT compatible with the ar10 platform. Why would any 5.56 work in a .308? This is 5.56 NATO ammunition. This ammo is the same ammo used by our military. This batch is a factory over run, Palmetto bought it and the savings are passed on to us. Buy it, you won't be disappointed. It is accurate and reliable. How do i get my rebate on the 1000 rounds with the 10x mags? BEST ANSWER: The manufacturer usually asks for a copy of you purchase receipt and the UPC code from the box(es). This should not be a problem if the ammunition is shipped in a complete case. It’s a rebate through Federal just send in proof of purchase and fill out the form. Download the rebate form, fill it out, send invoice and upc's to federal and wait. Go to Federal Premium page. There are links to promotions. Can the ammo be shot indoors at the PSA gun range? BEST ANSWER: Most indoor ranges DO NOT allow steel-tip ammo!! Are these round reloaded? And, if not, are they annealed? BEST ANSWER: This ammo is first rate Federal ammo. Federal does not make reloads. The cases are annealed. Can the ammo and mags be shipped to different addresses? Can the ammo and mags be sent to different addresses? I need the ammo and a friend needs the mags. BEST ANSWER: No it’s all packaged as one. Do these have military crimped primers? Can I purchased now and sent when in stock so I can take advantage of the rebate? A great way to get extra mags. The mags are Gen 2 and brand new. Very happy with those. The brass is very dull, and some of it's dinged, making me wonder if these are reloads. If so, the price is still probably good, but that's not what I was expecting. Great deal, good ammo and love the vortex ! Great ammo and great magazines, can’t beat the combination. I am happy with the product just wish we could get it cheaper!! If you consider at least $10 per mag, it amounts to about 25 cents per round for the M855. Best price I can find!!! great deal on good products. separate, they are good products but combines at this price they are a great deal. enough ammo to practice with for a good time period, and the extra mags you need. as former military my buddies and i like 14 mags per gun, and we used Pmags in Afghanistan on my last 2 tours. Once again the daily deal has struck my wallet! Great deal with the mags included. GREAT deal.... ammo is top notch. Good deal on sale. Mags are great and ammo is as expected for price. Great deal if you looking for mags and ammo. P mag always has great quality and awesome plinking/rabbit hunting ammo. No problems so far. This is a good deal. Thank you Palmetto State Armory for offering such an awesome deal, the bullets are green tip 62 grain and you can't go wrong with Magpul mags. Amazing going to be ordering again. This is an awesome deal, great products, don't have any complaints. Have already told a few friends to order. Great package deal for the price. Easy to load. Well made. Good deal, the mags are great. I’ve purchased many things through Palmetto, and so far I have zero complaints. Everything seems to ship fast and come exactly as described. They’re gaining a life long customer here. Everything was just as I expected. Fair price and very nice people to deal with. A great ammo for target shooting, plinkering, and or zero in the scope. Reliable and no issues. The ammo alone should have cost what I paid for the case of ammo and 10 pmags. I couldn't pass on this. Great ammo, clean and good grouping. I ordered 2000 more. This was a no brainer, 10 pmags with a case of ammo at the price the ammo alone would be. I jumped on it. You can never have too much ammo.